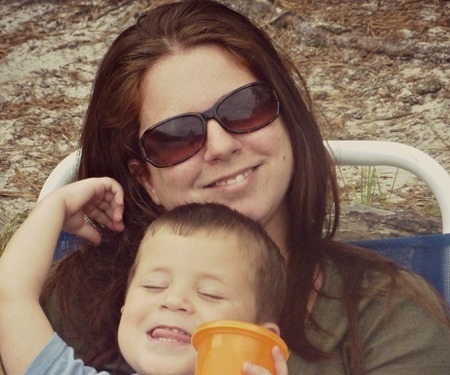 Over the next few days I will be introducing a variety of moms that I have met through blogging. I asked them all a series of questions and have loved reading their answers – so I hope my blog readers enjoy them too! I am calling this series “A Mom a Minute.” Today, let’s spend a minute with Sara from Confessions of a Redheaded Mama! Baby Boy # 2 – Due in May! Little Bear is really into Bubble Guppies and Peter Rabbit on Nick Jr. He also recently has mastered the mouse on the computer and begs to play computer games. I actually need to set a timer when he is on the computer. This way it’s very clear that computer time is over. Besides preschool twice a week we don’t have Little Bear signed up for much. I don’t want to be that mom who has her kid signed up for every single class/activity even if they don’t enjoy it. I think this summer we will sign him up for a weekly class at the YMCA for introduction to sports. It basically does a little bit of everything and is geared towards 3-4 year olds. We also will be starting speech therapy and most likely that will be twice a week. crowded so go early. I’m hoping the next time we go to Disney that Little Bear will enjoy the rides and overall experience more. grilled cheese and Burger King chicken nuggets. Having more patience. I really hope that my low tolerance level is due to my pregnancy because I need to have more patience. Little Bear was in the NICU for a week after he was born and I didn’t hold him until he was 3 days old. I mention this because I wouldn’t say I felt this immediate bond with him. In fact, the NICU nurses kept telling me i needed to talk to him more because I would just sit there quietly and hold him. The truth was I was a new mom and scared to death with my baby hooked up to a bunch of machines. It was his 5th night in the NICU and Tommy and I were alone in the room with him. Little Bear had a booger that I could see in his nose. I didn’t even think twice but I just picked it right out of his nose. Nothing like wiping boogers to make you feel like a mom. To follow your gut. You know your child best and your mommy instincts will know exactly what they need. Don’t forget to visit Sara at her blog! And come back for even more mom minutes next week!